Day, Ethan. 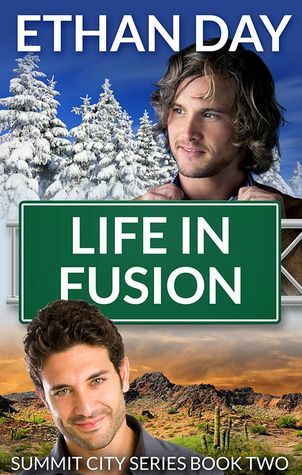 “Life in Fusion”, ADS, 2015. Now that the time Boone spent with Wade is over, he is certain that the hardest thing to do will be to say goodbye to him. They decided to spend six months apart to make sure that what the two men felt for each other was actually love. However, once being without Wade actually happens, Boone realized that love can be very hard. He also realizes how easy it is to be broken by love. He really begins to believe that he and Wade were meant to be together. Now back in New Mexico and at home, Boone is overwhelmed by what he has been through. Wade thinks that maybe Boone is pulling away but the truth is that they are both dealing with separation and the anxiety that it causes. For those of you who read Ethan Day’s “Sno Ho” know that this is the sequel to it. We get a look at the way others react to the new coupling. Boone is a wonderfully created character and filled with humor and wit. But he is also vulnerable emotionally and Ward is very careful with him. Boone wants a long-term relationship, yet he worries that he is not worthy of such a commitment. Wade accepts Boone’s quirkiness and the love they share is strong, so strong that their families’ and friends’ crazinessess are accepted by both men. It is amazing to see them get along so well when they are actually total opposites. This is a book that will make you feel good and keep a smile on your face as you read. The story begins where “Sno Ho” ended. Boone is back in Albuquerque, New Mexico and Wade still in Summit City, Colorado and Boone has agreed to move to Summit City at the end of six months.I t fluctuates back and forth between the two cities, depending on who was visiting whom and you get a good description of the individuals that are important in each man’s life. We meet their families and their friends and it is almost as if we are included in their lives. Like its predecessor, this is a fun read and sometimes that is just what we need.